AOPA National Assembly – this is the country’s longest serving and largest meeting for the orthotic, prosthetic and pedorthic profession with concurrent sessions for Orthotists, Prosthetists, Pedorthists, Technicians, Business Owners and Managers, and a 100,000 Sq. Ft exhibit hall packed with the latest products, services and technology. In 2019, the National Assembly will be September 25-28 in San Diego, California. AOPA Mastering Medicare: Essential Coding & Billing Techniques Seminars – AOPA experts provide the most up-to-date information to help O&P Practitioners and office billing staff through our 2 day seminars, offered 4 times throughout the year. Attendees earn 14 CEs. 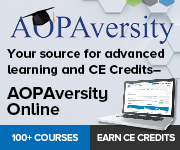 AOPAversity Online Video Learning – AOPA’s video learning library offers many different types of high level education. Clinical, business, motivational and more. After viewing the educational video in its entirety, complete and submit the quiz continuing education (CE) credits. On a quarterly basis AOPA will transmit the information to both ABC and BOC for those with passing grades of 80% or higher. Mastering Medicare: Coding & Billing Basics and Principles contains nine modules is a recommended prerequisite to the Advanced Coding and Billing Techniques Seminar. Practice Management: O&P Administration Services contains three modules, 1. Establishing an O&P Practice; 2. Acquiring an existing O&P Practice; and 3. Enrolling in Medicare and Medicaid. Webinars (Formerly Audio Conferences) – During these one-hour sessions, AOPA experts provide the most up-to-date information on a specific topic. Perfect for the entire staff–one fee per conference, for all staff at your company location ($99 Member/$199 Non-Member). A great team-building, money-saving, educational experience! Sign up for the entire series and get two conferences FREE. Entire Series ($990 Members/$1,990 Non-Members). The fee is per computer terminal and there is no limit on the number of staff you can assemble in one location. O&P Almanac – AOPA is pleased to offer CE credits associated with the monthly Reimbursement Page and the Quarterly Compliance Corner of the O&P Almanac. Readers can earn 2 Business Continuing Education (CE) Credits each time you read these articles and pass the accompanying quiz. Business Certificate Program – Earn your business certificate in O&P Business Management from AOPA. With 100 years of service to the O&P profession, AOPA is a reliable partner to provide high-quality and relevant business education to the O&P community.